Whatever the size of your back yard, an outdoor shed will help to keep it neat and organized. Backyard sheds come in a variety of materials, sizes and shapes that will accommodate everything you need to store. With carport kits, you can even park your car in the shade. Backyard sheds are available in metal or wood, so you can choose the durability and appearance that best fits your needs. Factors to consider include cost, durability, maintenance and security. Metal sheds are strong and durable. They will withstand harsh elements like severe thunderstorms, heavy winds and scorching sun. 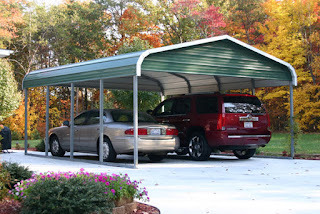 They require little maintenance and provide excellent security for your stored items. Wood sheds are made of strong, treated wood that resists rot and decay and damage from insects. They are strong and durable and require little maintenance. Generally, wood sheds are more expensive that metal sheds due to the cost of lumber. Backyard sheds can be used for a variety of storage needs. They can even be customized with electricity, heating and cooling, and plumbing, so they can be used as outdoor spaces that provide a lot more than just storage. Take a look at a few ideas for your backyard shed. A backyard shed is the perfect place to store garden tools and equipment. You can easily customize the interior with hooks and shelves to hold garden tools, watering cans, hoses, and gardening products and create a potting station for planting annuals and perennials. If you get a large shed, one size can hold larger items like edgers and trimmers, wheel barrels and lawnmowers. A backyard shed can make a great playroom for your kids and their friends. They can play all day in a private, secure backyard space. By adding a table and chairs, some fun board games, and handy storage containers, the kids can get creative and messy without destroying the house. Throw in a soft, outdoor rug and some cozy floor pillows and your kids will feel like they have their own little house. Many people prefer working out and exercising at home rather than in a gym. It's certainly cheaper, and you have much more flexibility with exercise schedules. Gym equipment like treadmills and weights take up a lot of floor space in your home, so why not create your own personal gym in your back yard? You can even customize it with a snack bar, mini fridge and stereo system.